For other uses, see Voodoo doll (disambiguation). The term Voodoo doll is commonly employed to describe an effigy into which pins are inserted. Although it comes in various different forms, such practices are found in the magical traditions of many cultures across the world. Although the use of the term Voodoo implies that the practice has links to either the religion of Haitian Vodou or Louisiana Voodoo, in reality, it does not have a prominent place in either. 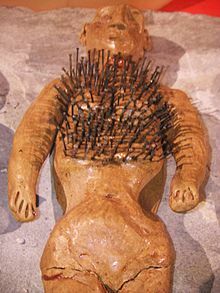 The form of the voodoo doll as it is most commonly understood is based on a magical practice that historically derived from Europe rather than Africa or the Americas. Textual records attest to the fact that certain cunning folk in Britain made dolls of a witch out of rags and other materials and then pierced them with pins with the intention of inflicting physical harm on the witch and breaking their bewitchment. The link between this magical practice and Voodoo was established through the presentation of the latter in Western popular culture during the first half of the 20th century. In this, the myth of this magical practice being closely linked to Voodoo and Vodou was promoted as part of the wider negative depictions of blacks and Afro-Caribbean religious practices in the United States. In John Houston Craige's 1933 book Black Bagdad: The Arabian Nights Adventures of a Marine Captain in Haiti, he described a Haitian prisoner sticking pins into an effigy to induce illness. Its use also appeared in film representations of Haitian Vodou such as Victor Halperin's 1932 White Zombie and Jacques Tourneur’s 1943 I Walked with a Zombie. In the 1975 film, Lisztomania, a voodoo doll is used, resembling Franz Liszt. In the 1984 film, Indiana Jones and the Temple of Doom, a voodoo doll is used, resembling Indiana Jones. By the early 21st century, the image of the voodoo doll had become particularly pervasive. It had become a novelty item available for purchase, with examples being provided in vending machines in British shopping centres, and an article on "How to Make a Voodoo Doll" being included on WikiHow. A voodoo doll had also been included in the 2009 animated Disney movie, The Princess and the Frog. ^ a b c d e f g h i j Armitage 2015, p. 85. ^ Armitage 2015, pp. 85–86. ^ Hutton 1999, p. 96. ^ Armitage 2015, p. 86. Faraone, Christopher A. "Binding and Burying the Forces of Evil: The Defensive Use of "Voodoo Dolls" in Ancient Greece". Classical Antiquity. 10 (2): 165–202. Hutton, Ronald (1999). The Triumph of the Moon: A History of Modern Pagan Witchcraft. Oxford: Oxford University Press. ISBN 0-19-820744-1.